Drain Clearing, Clear Blocked Drains, Unblocking & Drain Cleaning for Bridgnorth, Shrewsbury and Kidderminster. 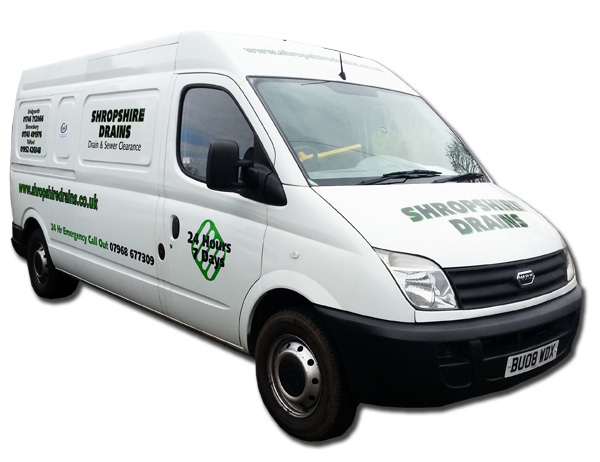 Shropshire Drains, an established local Bridgnorth company with over 20 years experience in carrying out drain cleaning, unblocking, cleaning and maintenance work covering the West Midlands, Shropshire and Worcestershire area. Ideally situated for Bridgnorth, Broseley, Much Wenlock, Shrewsbury, Telford, Ludlow, Craven Arms, Church Stretton, Ludlow, and Cleobury Mortimer and Wolverhampton. We are a family run Bridgnorth business with over 20 years experience in the drain cleaning industry. Shropshire Drains are an independent firm of drain cleaning contractors and this enables us to keep our prices low and offer the best value for money. Our office occupies a prime central location and offers a professional and friendly service. We have an excellent local team that can be contacted 24 hours a day, seven days a week, even if it’s just to ask for advice. We provide independent advice to all whether they are customers or not regarding any drainage problems you may have. We believe that a customer needs to be given every opportunity to have problems solved as quickly and as cost effectively as possible. Our aim is to maximise every opportunity for good customer relations to ensure a reputation that has been built by commitment and the highest possible standards. Our emphasis is on establishing a regular direct personal contact with all customers in order that the best possible results can be achieved. The areas we cover are West Midlands, Shropshire and Worcestershire area. Ideally situated for Bridgnorth, Broseley, Much Wenlock, Craven Arms, Church Stretton, Ludlow, Cleobury Mortimer, Shrewsbury, Kidderminster and Wolverhampton. Shropshire Drains currently work with local councils, hospitals, property services, water authorities, factories, shops, domestic properties as well as top named companies.